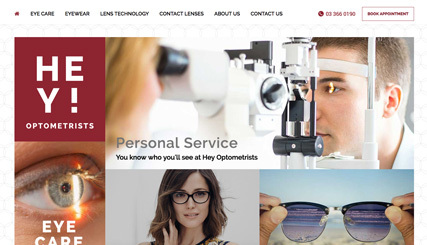 We custom designed and developed a mobile friendly website for Hey Optometrists with the goal of making the website more professional and engaging; particularly for a younger market. The website clearly showcases the range of eyewear available, explains the technology behind the lenses and provides an online booking for eye examinations. A local SEO focused campaign ensures that the website can be found by the company's target market. Having a broad target market, we wanted to redesign our website to ensure we were meeting the needs of a younger market, particularly those using mobile devices, without alienating our older demographic. We chose Limelight Online as, from the first meeting, they grasped what we were trying to achieve and have provided us with a beautiful custom designed responsive website that also allows for online appointment requests. We've been very impressed with Limelight's professionalism throughout the whole project; they are very communicative and always deliver on their promises. It’s been a pleasure working with them and we'd recommend them to anyone looking to upgrade their website.